Send your comments or questions to Puerto Rican 101 at email us and include "Puerto Rican 101" in the subject line. We receive hundreds of questions weekly and answer most of those directly, but select just a few for this site. This page is edited by Ivonne Figueroa. Do Puerto Ricans point with their lips? Read more below . . . . If you are a birdwatcher, then Puerto Rico needs to be added to your must-visit bucket list. Puerto Rico has so many different geographical regions, all within a small 35×100 mile area — rain forests, dry forests, and forests in-between, seaside, mangroves and mountains. Due to this fact (and our wonderful winter weather), you can see many different types of birds during a short visit to the island, especially if you know where to look. You have a pretty good chance of seeing at least a few of the 17 endemic birds and many of the 300 different types of bird species that call Puerto Rico home at some time throughout the year. 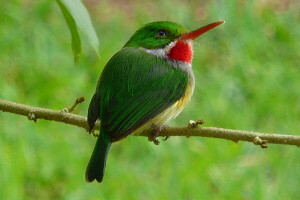 At El Yunque you can spot a number of endemic and migratory birds like the PR Tody, PR Oriole, PR Woodpecker, PR Emerald Hummingbird, the orange-fronted parakeet and the male pin-tail Whydah (during mating season). But there are many others that can be seen on a daily basis, such as the bananaquit (Coereba flaveola), red tail hawks and the PR Lizard Cuckoo. One bird you should not expect to see is the endangered Puerto Rican parrot. With only a few dozen left in the wild, it would be an extremely lucky sighting! In case you are wondering, it looks like this . . . . Fully grown Puerto Rican coquí. More than one coquí is coquíes not coquís. There are about 16 different species, all sing a bit differently. Speaking Puerto Rican . . . 'bochinche' - ruckus, melee, disturbance, or uproar, large disagreement that included shouting, including gossiping and badmouthing going on about a 'scandal' etc. 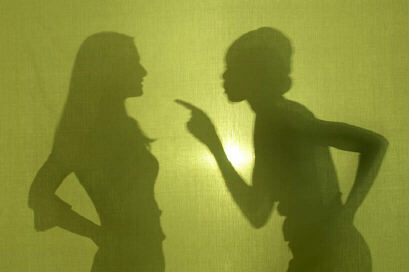 Example: There was a brawl or a fight after the dance and the police had to be called. Ajíes Dulce for your sofrito . . . . . these cannot be found outside of the east coast. Have to grow your own. Buy seeds online. They can be sucessfully grown in Phoenix, Southern California, South Texas, and South Florida. I have two plants that I 'wintered' indoors on a window ledge and picked my first 'cosecha' (harvest) in April. 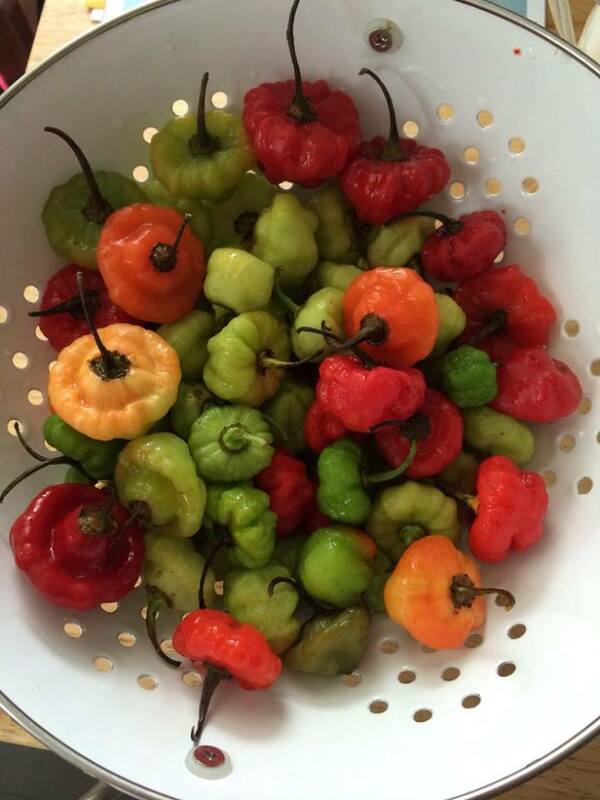 Yes, you can make sofrito without this, but it is better with them. Delish! Fertilize the plants before and after winter. This is the Aleli flower, grows wild in Puerto Rico. 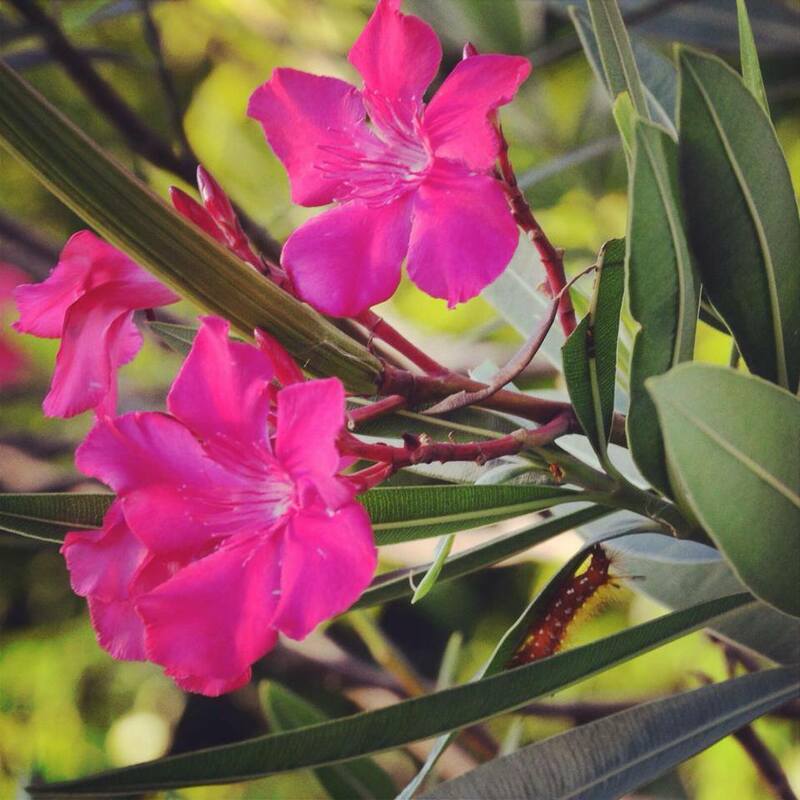 In the States the bush is known as Oleander. I have it all over my yard and remember Puerto Rico when it is in bloom. It is a favorite for a certain butterfly. 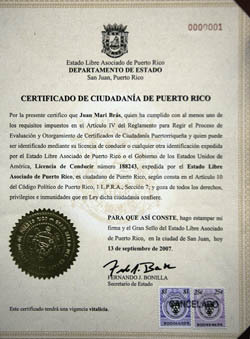 Juan Mari Bras is the only Puerto Rican to have official 'Puerto Rican citizenship', instead of American citizenship. Bras denounced his American citizenship then claimed and was awarded Puerto Rican citizenship by island courts. While the local Puerto Rico courts accepted the premise of Puerto Rican citizenship, later the US denouced Bras' Puerto Rican citizenship and confirmed that he continued to be an American Citizen. Mr Bras continues to live in Puerto Rico and is a fierce Independentista. What does the word criolla mean? I see it on your site but I'm not sure. Are all criollas Puerto Rican? Is it the same thing? 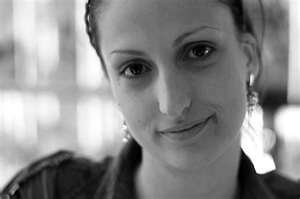 Laurie Rodriguez Sanchez, in South Carolina. Laurie we use this term in our website to mean things that are native to Puerto Rico - foods that came from Spain but have adapted to reflect our island flavor. This is an old term used in Colonial Times.. It was the old 'class' system and we don't follow that today. A peninsular is a person living in Hispanic Latin America, who was born in Spain. A criollo, is a person born in Hispanic Latin American, whose ancestors are Spaniards. That also includes their descendants as long as there is no intermarriage between races, then the offspring is not called criollo - sometimes they are referred to as mulato (mixed with African) or mestizo (mixed with Indian). Why do we use the term 'Hispanic Latin America' here? Because not all Latin America is Hispanic. Hispanic refers to the Spanish Language and Brazilians speak Portuguese - they use different terms. 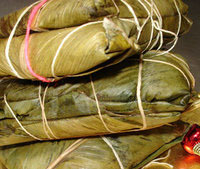 A criollo is not a direct traslation of the English word Creolle. It is similar, but a criollo is a person of Spanish descent, white, born in Hispanic Latin America. 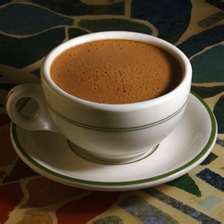 Today the word Criollo is used to refer to those that are local or homegrown. Islanders have become criollos - no matter the race. In the United States the word creolle is often used to refer to; a person born in the West Indies or Spanish America but of European, usually Spanish, ancestry, or a person born in Louisiana but of usually French ancestry, or a person of mixed black and European, especially French or Spanish, ancestry who speaks a creolized form of French or Spanish, a creolized language. Not living in Puerto Rico since my teens and living where there was not much access to what we call viandas, it was hard for me to tell the difference between a yautia, a malanga and a yuca. Yuca is really no problem, they tend to have a thick smoother skin and are longer and pointier than a yautia. See photo on the right. Now how can we differentiate between a malanga and yautia? Not as easy, here where I live, the names for these items are different. Both looks very similar, both are brown with sort of stripes across and both have a fibers growing on the skin. The malanga tends to be more round and that what I look for. Yautias come with white or purple centers, see photo on the left.. Still can't tell the difference from looking at the skin. The same thing for the malanga. I never ate yuca at home because my mother was afraid to serve them. She said they were poisonous. And she was partly right. Raw, uncooked yuca has a poisonous core, but once it is cooked it is not dangerous. Now I cook yuca at home and serve it boiled, drizzled with olive oil and with raw sliced onions. Yuca, yautia and malanga are part of a group of foods we call viandas which also includes potatoes, apio (celery root), and ñames. Viandas are usually vegetables that grow in the ground. When someone says I'm going to serve viandas that could include a number of these root vegetables and most likely also green plantains and or green bananas, avocado and boiled eggs. If they say vianda con bacalao, they will also add bacalao. The vegetables are cooked, drained and served drizzled with olive oil. The dish will also include rings of fresh onions. Ñames are the 'true' yams and are shaped like a long sweet potato, the flesh of Ñame is creamy or yellow in color while its skin can be light brown, dark brown, or tan. Its flavor is somewhat nutty with a slightly chewy texture similar to a potato. 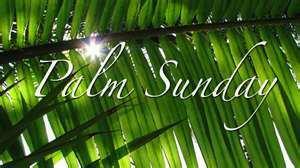 Palm Sunday is a Christian moveable feast that falls on the Sunday before Easter. The feast commemorates Jesus' triumphal entry into Jerusalem, an event mentioned in all four canonical Gospels. (Mark 11:1–11, Matthew 21:1–11, Luke 19:28–44, and John 12:12–19). In many Christian churches, Palm Sunday is marked by the distribution of palm leaves to the assembled worshipers. Hosanna ! - And Yes, Catholics elsewhere celebrate like this but not all do. Other Christian faiths also recognize the palm but not make it a habit to distribute. The brown coconuts, with the hard brown shells at the store, are mature coconuts. 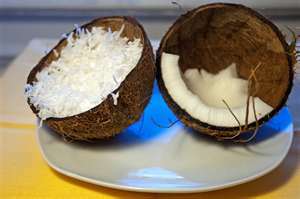 The outer skin on the hull turns from green to brown when ripe and the brown coconut shell inside hardens as the coconut matures. These mature coconuts are peeled from the hull by the time they reach the grocery store. The coconut fruit inside the brown shell is mature so it is thick and hard. Coconuts at the store in the states (away from coastlines) are often spoiled, you can tell because the water is rancid - has a funny smell and taste. Before you buy, check the 3 'eyes' or three circles on one the the ends the coconut shell. These 'eyes' should be hard and dry - not moist. I read on the internet where Antonio Paoli was a boxer as well as an opera singer. Is this true? Roman Rodriguez Rivera, Jersey City. Yes, it's true! Antonio Paoli was born on 1871 in Puerto Rico. His nickname in Puerto Rico was the King of Tenors. Antonio died of cancer at the age of 75. At one time he lost his voice and later was treated and recovered. During this time he lost his voice Paoli became a boxer, was undefeated on his first five fights, then broke his wrist ending his boxing career. Then he went back to the opera. But, hey there's more. . . . In Antonio Paoli, Puerto Rico had the first Puerto Rican to reach international recognition in the performing arts. He gave 1,725 performances between 1888 and 1942 and interpreted Verdi's Otello 575 times. 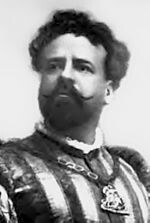 To his credit, Paoli was also the first opera singer in the world to record an entire opera when he participated in a performance of Pagliacci by Ruggiero Leoncavallo in Italy in 1907. Working towards an advanced science degree with a full time job. Not much time for cooking, but missed mi terruño so much that I had to try cooking Puerto Rican. Loved your Pastelon de Platano Maduro recipe. Thanks for all the pictures. I was able to follow it step by step. Had to mail order the amarillos and sofrito. I cooked it in my large toaster oven. It was more than perfect. Delicious in every way possible. Next week I am buying a small crock pot to try making soup with bolitas de harina like mami makes. It gets very cold here in Vancouver. Thanks for your comments Corina. First you can post questions on our FaceBook page. I will post answers at least once a week. Yes, you can use the crockpot for flan, still have to put the mixture in a caramelized mold and add water to the bottom of the crockpot to form a baño de María. The mold will have to fit inside the crockpot. It needs to cook on high for half a day. Test it with a knife before you remove the mold from the crockpot to be sure it is done. The larger the flan the longer it will take to cook. Thanks for sending your photo. Do Puerto Ricans point with their lips? That is a common inquiry we receive. It was previously listed on this channel but has since been removed due to space issues - but it is time to bring this topic back. And the answer is YES! Islanders do, not so much Puerto Ricans outside the island. Islanders purse the lips to point to a specific direction or person, thing etc, with minimal (if at all) movement of the neck. How is this possible? Where did we get this from? Well, it seems other Latinos (not all) do the same thing, therefore does it mean that it comes from Madre España? I haven't found anything that point to an Iberian (Spain) connection yet. However I found that it is common in American Indian Tribes so that may mean it is a Taíno cultural trait. 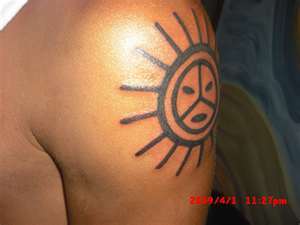 It is said that Taínos came from South America. Native Americans migrated from North American to South America, then to the Caribbean. Of course this happened over thousands of years and each group that settled in different areas developed their own identity before migrating again. In the winter I ask my wife to put a piece of cheese in my hot chocolate and she thinks I'm crazy. I tell her this is a Puerto Rican thing. What else can I tell her about this? Jaime Rivera Ponce; Los Angeles, CA. Yes, this is a Puerto Rican thing. Tell her to buy Queso de Bola Holandes, which is what we use in Puerto Rico. It makes the best hot chocolate or cocoa ever! It is not strange, we do this all the time. Of course the hot chocolate must be hot enough begin to melt the cheese. You will also need a spoon to finish the cheese after you are done with the cocoa. Maggie Santos Dominguez in Honolulu, Hawaii writes . . . . Please tell me the difference between red and green sofrito. One says Sofrito the other Recaito. What gives? Maggie, these are pretty much interchangeable. 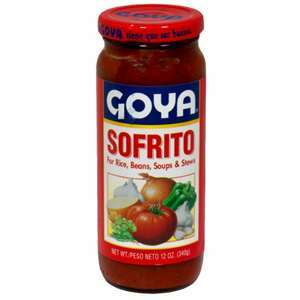 The red sofrito is a Goya brand that includes tomato sauce. The green Recaito does not include tomato sauce and has a cilantro base. These are products packaged by Goya but are also sold under other brands. The green sofrito we make at home is the 'real' thing. No tomato sauce is included. People who live where they can't find achiote like the red sofrito. When using store bought sofrito remember that it is not as potent as the homemade product and you might want to use a bit more. 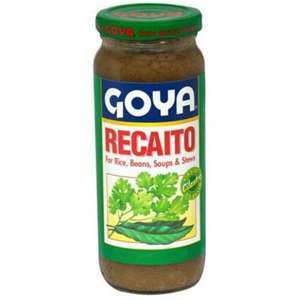 Basically if you are making rice or beans use the red sofrito. For dishes that shouldn't have tomato use the green bottle. Tomato gives the food color and a little sweetness. If and when I buy bottled sofrito I select the green, unless they only have red. No big deal really. 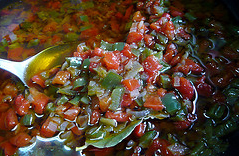 If using the red sofrito add some cilantro or recao to the dish in addition to the red sofrito. The word Sofrito comes from the Italian word Sofritto, which pretty much means the same thing, a blend of seasonings, the Italian version has slightly different ingredients than ours. The word comes from Italian immigrants to Puerto Rico during Spanish Colonial times. In the old days, sofrito, was diced; there were no electrical appliances to grind it. I prefer diced sofrito than the one processed in a blender. You can taste the ingredients and makes it a more delicious meal. Martin Otero questions the Taíno associations that have cropped up in recent years. I have been contacted by their leader, Pedro Guanikeyu Torres, in the past. He wanted me to correct some things I wrote on my article. I did make some changes but refused to delete reference to the Caribs being cannibals, which all historical documents testify to. Growing up in Puerto Rico I was taught that Taínos had all died out. But now I find there is a considerable number of Puerto Ricans who's family oral history declares their ancestors were Taínos. It is logical that descendants of Taínos would still around, certainly. Even though there is no recorded confirmation or affirmation that not all Taínos died, I don't doubt their claim. Oral histories are certainly very much valid. Even now in recent years there are studies that say at least 50% of the people who's DNA was tested have a Taino ancestor. So that validates their claim. To me they are Puerto Rican first, Taínos by heritage. Of course remember that Taínos lived all over the West Indies, even in the Bahamas, so not all people who are Taínos descendants are Puerto Rican. Rose Wood says . . . I found that the name Cintron comes from the Canary Islands. Probably not that common in Spain. Most Puerto Ricans have Canary Islands roots. I stumbled upon your website and absolutely love the song that plays when you go to the 'recipe' section. Can you tell me the name of the song and artist? Naomi. Glad you asked! That is one of my favorite old songs too. My grandmother used to sing it all day long in Cayey when we were children. I added it to my recipe page so that I could remember her. The lyrics and music written by our very own Rafael Hernandez, author of Preciosa and many others. Rafael wrote this piece while living in Cuba, therefore the word guajirita instead of jibarita. It was sung and recorded by Rafael Hernandez and also by Daniel Santos. Often the word guajirita is switched to jibarita when being sung by Puerto Ricans. quiero cantarle a las flores el canto de mi montuna. Es mi vivir... una linda guajirita la cosita mas bonita, trigueña. Es todo amor lo que reina en mi bohio donde la quietud del rio me ensueña. Luego se ve a lo lejos el bohio y una manita blanca que me dice adios. This is what we found in our search as the ten largest towns in Puerto Rico. 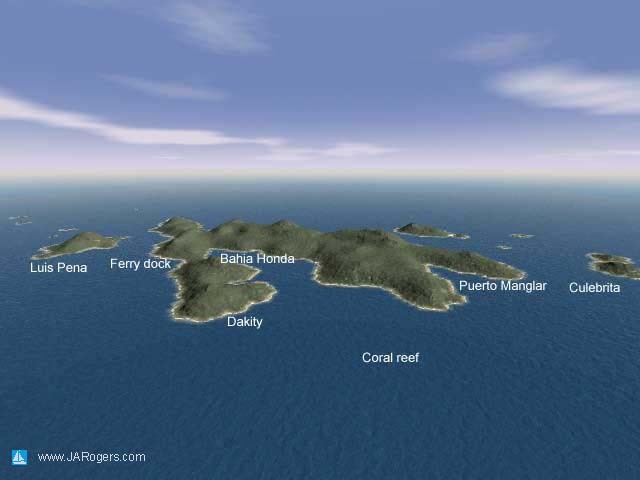 Puerto Rico is made up of at least 143 islands, cays, islets, and atolls. Only the main island of Puerto Rico and the islands of Vieques, and Culebra are inhabited. The island of La Mona has personnel from the Puerto Rico DRNA (Departmento de Recursos Naturales y Ambientales) stationed there year-round but no private citizens inhabit it (other than overnight camping guest and nature enthusiasts). The other 140 islands, keys, islets and atolls and not inhabited. I've attempted a listing here. Fact . . . . The University of Puerto Rico is the state university system of Puerto Rico. The system consists of 11 campuses and has approximately 64,511 students and 5,300 faculty members. UPR has the largest and most diverse academic offerings in Puerto Rico and the Caribbean, with 472 academic programs and 32 doctoral programs. Trivia . . . Puerto Rico has more automobiles than people with a license to drive: 3.3 million vehicles registered 2.3 million people with a license to drive. Hey, I read that Bacardi Rum is not really Puerto Rican? Please explain? Jon Gracias Troche in Paris, France. There are two 'major' island rum companies, Barcardia and Don Q. Don Q is a Puerto Rican rum, distilled, manufactured, bottled, and distributed by Destilería Serrallés from its corporate facility in Ponce, Puerto Rico. It is sold internationally, and competes against Bacardi for market share. The rum is named after Don Quixote, the protagonist in Miguel Cervantes' classic Spanish novel. I guess you can say that the brand Don Q has not done such a good marketing job as Barcardi. Bacardi rum, is made in Puerto Rico. The founders relocated from Cuba due to political turmoil and it wasn't until that relocation that the rum, now made in Puerto Rico, became so popular. Now Barcardi has offices throughout the world, but yes, Barcardi is Puerto Rican. Don Q is the best selling rum in Puerto Rico followed by Barcardi. We assume you are referring to the green iguanas. 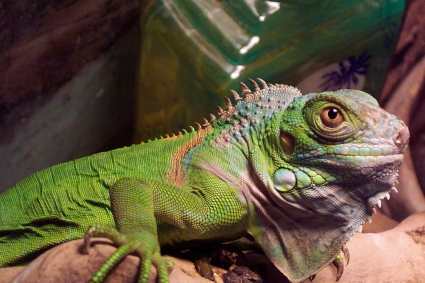 Interestingly enough, the green iguanas are listed as endangered species due to the fact that their natural habitats, tropical rain forests are disappearing throughout the American Continent. Pet shop iguanas are generally bred and hatched in captitivy and thereby exempt from Federal Government restrictions on ownership. They have multiplied heavily in Puerto Rico after being set free, once they overgrow a terrarium. Usually they scurry away when in too close proximity with humans. They are plant eaters and sometimes tend to bite if cornered or teased. Stay away. The proliferation of green iguanas in Puerto Rico has created headaches for many people. At the Luis Muñoz Marín International Airport, for example, many flight takeoffs have been delayed when green iguanas have been spotted basking in the sun right on the runway. Airplanes cannot take off until the green iguanas are scared off the runway. Iguanas also create traffic hazards when they choose to walk or bask in the sun in heavy traffic areas. Is there whale watching in Puerto Rico and when? Taine Baltazar in Chicago. Around the first half of November each year, thousands of hump-back whales (ballenas corcovadas) make their way from the North Pole to Atlantic waters north of the Dominican Republic to practice their mating rituals. At times they also cross into the Caribbean Sea through Canal de la Mona, the deep trench that separates the Dominican Republic from Puerto Rico. The town of Rincón in the northwestern corner of Puerto Rico features a lookout area for whale-watchers. It is a frequently visited oceanside mini-park with free parking, cafeteria, souvenir shop and a few coin-operated telescopes. The park is open year-round. Admission is free. Visitors also pay a small fee to ride boats that get closer to the whales. Pepe, the answer is YES, certainly some islanders do. Santeria is the popular name for a set of religious beliefs which are a blend of Catholic and African religious traditions. It developed in the Spanish-speaking islands of the Caribbean during the first centuries of Spanish colonization. Spanish missionaries attempted to teach the Catholic religion to black Africans brought as slaves, mainly from the Yoruba tribe in what is now Nigeria. It is believed that the African slaves accepted reluctantly the teachings of Spanish missionaries. They were threatened against practising their own religious rites. Fear of punishment may have had much influence in the resulting blend of beliefs. From the beginning, Santeria had a lot of similarities with the Catholic Church, like worshiping of saints, mass, lighting of candles, and celebrations of the saintís holidays. Throughout time, many Catholic Puerto Ricans became followers of Santeria. The same thing happened throughout other Spanish-speaking nations in the Caribbean and Latin America. Each country developed its own set of beliefs, always in the bipolarity of Catholic and African cultural traditions. To this day, many people practice Santeria in secret because they do not want to be criticized by the Catholic church that is against this practice. 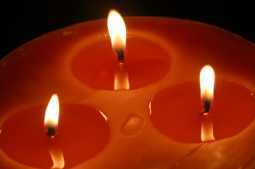 Secrecy has been a key feature of Santeria since it began to be practiced in the Caribbean. Slaves were forbidden to practice their rituals by Catholic missionaries, and severely punished if caught in Santeria rituals. The Bermuda Triangle is bounded roughly by Florida, Bermuda and Puerto Rico. Bermuda Triangle, the best-known of a variety of folk names given to a triangular region of the Atlantic Ocean whose apexes are Miami, Florida; San Juan, Puerto Rico; and the island of Bermuda. Numerous ships and aircraft have disappeared in the area, the most famous being a flight of five U.S. Navy Avenger torpedo bombers that failed to return from a routine training mission in December 1945. Other losses range from small pleasure boats to the 542-foot U.S. Navy collier Cyclops, lost with all hands in 1918. Since the 1960s, some commentators have attributed these disappearances to powerful, mysterious forces that include UFOs, time warps, and the "lost continent" of Atlantis. Scientific and maritime authorities have consistently rejected these explanations in favor of naturalistic ones such as turbulent seas, rapidly changing weather conditions, and the errors of inexperienced sailors and pilots. The name "Bermuda Triangle" first appeared in a 1964 Argosy Magazine article by Vincent Gaddis. A widely reprinted 1967 National Geographic Society press release gave it national prominence. Charles Berlitz's sensationalistic book The Bermuda Triangle (1974) and Steven Spielberg's references to the Avengers' Flight 19 in his film Close Encounters of the Third Kind (1977) bracketed the peak of the legend's popularity. Wood from the native tree “El Guayacan” is so strong that it suffers less wear than steel. There is a 400-year-old Guayacán tree in the Guánica Dry Forest. About 2 km east of Copamarina look for green gates on both sides of the road. Follow the path through the north gate; the path to the tree is clearly marked. This extraordinary guayacán tree has a trunk that measures 6 feet across. Puerto Rico hosts every major pharmaceutical company and produces about half the prescription drugs sold in the United States. Fact: According to census figures there are more Puerto Ricans living outside Puerto Rico than on the island. On the last census, 2000, there were 3.966 million people living on the island. Puerto Ricans living in mainland U.S. number over 4.1 million. 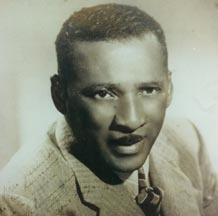 WKAQ-TV, Telemundo, was founded by Angel Rámos, who also owned El Mundo newspaper and WKAQ radio--Radio el Mundo--the first radio station in Puerto Rico, established in 1922. Telemundo received its FCC license to transmit over channel 2 in San Juan on 12 February 1954. It went on the air with regular programming on 28 March 1954.
Who said "We are a caribbean Nation"? I was a quote from former island governor Sila Maria Calderon, 2001-05. Sila María Calderón Serra (born September 23, 1942) is a Puerto Rico politician and businesswoman who served as the seventh Governor of the Commonwealth of Puerto Rico from 2001 to 2005. She is the first and to date only woman elected to that office. Prior to serving as Governor, Calderón held various positions in the Government of Puerto Rico, including Secretary of State and Chief of Staff. She was also Mayor of San Juan, Puerto Rico, the Capital of Puerto Rico from 1997-2001. Yes! Calle del Cristo, in El Viejo San Juan, was the first paved street in the New World. The very narrow streets, common in those times, was paved by the Spanish government and still has the original 'adoniques'. 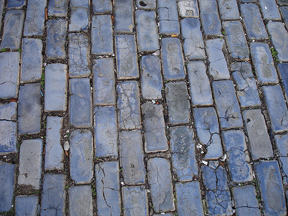 The adoquines, blue cobblestone bricks, were made with European iron furnace slag that, according to historians, was part of the ballast of the sugar carrying ships. Subjected to time, weather and traffic, the pavers have developed a very characteristic shiny blue-gray hue. Most of the narrow streets in Old San Juan are paved with adoquines. It is one of the most photographed streets in Old San Juan. Gothic churches are rare in the New World, but Puerto Rico has two: Porta Coeli, built in 1606 in San German, and San Jose, built in the 1530's in Old San Juan. Photo on the right is San Jose Church in Old San Juan. Juan Ponce de León, the first governor of Puerto Rico, was buried in the crypt of the church from 1559 to 1836, when his remains were exhumed and later transferred to the Cathedral of San Juan Bautista. However, his coat of arms is still located near the main altar. His grandson, Juan Ponce de Leon II is buried in the crypt beneath the Sanctuary's floor. Puerto Rican painter José Campeche is also buried in the church. Glaze for Pinchos . . . . Traditional: 6 garlic cloves (mashed) 2 teaspoons salt 1½ teaspoons pepper 3 teaspoons dried oregano 3 teaspoons olive oil 3 teaspoons white vinegar. Finding Recao . . . . The recipe calls for one plantain, using more will make the pasteles hard, but if you don't find guineitos verdes, then yes you can use plantains. Also add an extra potato or yautia.. If you can find yautias I can't see why you can't find green bananas. Just make sure you ask the staff if they have any green bananas in the back. Often they keep them in the back until they turn yellow. That is not so. As a matter of fact the coqui has now settled in the Hawaiian islands, where they are considered pests. Don't know which spicies made it over there. These coquies have accidentally been transported overseas in cargo, plants, fruits, etc. They are also heard in other areas in the Caribbean, but of course, they are not concentrated as they are in Puerto Rico. 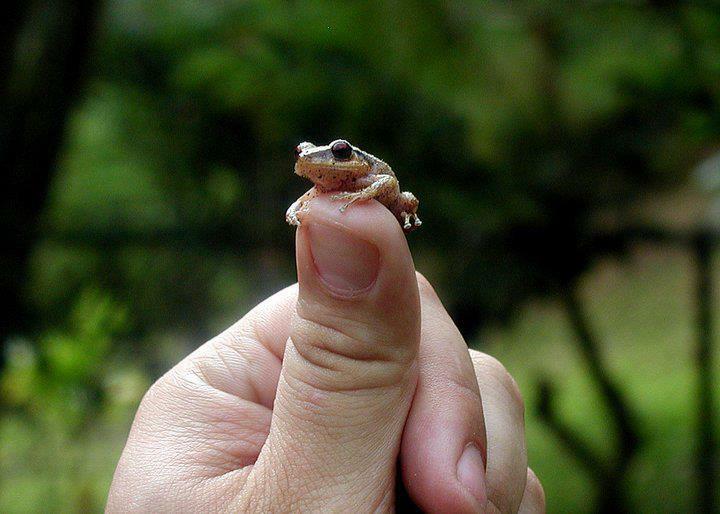 The coqui is not an ordinary frog, it is a tiny bitty tree frog, about 1" in length. This tuber has an elongated shape and the skin is bumpy, patchy, brown, and shaggy. The flesh inside is slippery, but crisp. 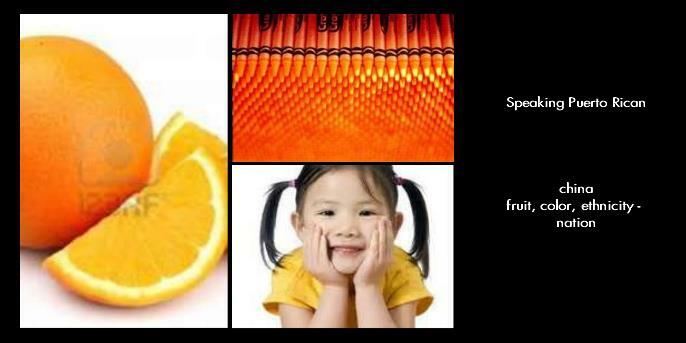 It can be white, yellow, pink or purplish. It has a nutty, earthy flavor with a waxy, starchy consistency when prepared. The ideal storage temperature is between 45F to 50F and it has a shelf life of up to one week. 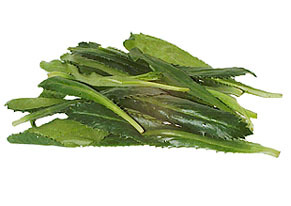 This root is often confused with taro. If you mix them up, don't panic. The two roots are so similar; you can usually interchange them in recipes. 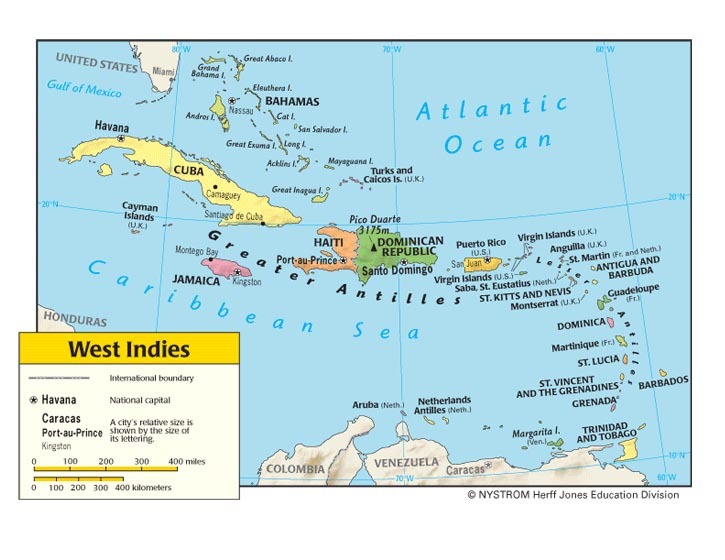 Named by Columbus, the West Indies refer to several large islands and island chains, over 3000 islands in all, that are mostly south and slightly east of Florida, east of Central America and Southern Mexico, and north of South America. Some of these islands are located in the Caribbean Sea, while others form a bridge between the Caribbean and the North Atlantic Ocean. See map below. The Greater Antilles, are the largest islands in the Caribbean; Cuba, Hispanola (Haiti/Dominical Republic), Jamaica and Puerto Rico (the smallest of the Greater Antilles. Caribbean islands, is a term for islands found in the Caribbean Sea. Progressive Parrandas . . .
For those that don't know about progressive parrandas . . . You could call Puerto Rican parrandas 'progressive' parties, that is they go from house to house and the group gets larger. So a progressive parrandas is where people are served a particular 'pre-arranged' menu at each house. Guests eat, drink, and dance, and then everyone follows to another location for the next dish - with music in tow, of course. The party can begin with appetizers at the first house, salad at another house, followed by the main course at a different location, and ends up with dessert at the last house. This kind of puts a kink on OUR tradition of serving soup at the last house, but it sounds like a great idea. El Morro - three flags. . .
Three flags fly over El Morro: the U.S. flag, the Puerto Rican flag and the old Spanish military flag (the cross of saint andres). Why, because the Castle or fortress has been ruled by Spain, the United States and Puerto Rico. Apparently there are several hotels in San Juan that accept pets. Some are the Hotel Miramar, the Sheraton Old San Juan Resort, as well as Hotel Normandie. Speak to your travel agent about this or search the internet and call ahead. You are correct. In 1946, President Harry Truman appointed Jesus T. Piñero, picture to the right, to the governor's seat. This marked the first time in history that the government of the United States appointed a native Puerto Rican to hold the highest office on the island. Piñero remained in office until 1948, when Puerto Ricans were allowed to choose their governor for the first time. In 1948, Luis Muñoz Marín became the first Puerto Rican elected to the governorship of Puerto Rico. There is only one Puerto Rican surname and that is Cofresí and all with this last name are related and descendants of the Cofresi family (El Pirata Cofresí). It is a shortened version of a long European name. The surnames Colón and Rivera tend to be more common in Puerto Rico than elsewhere and that's about it. Due to the large number of Puerto Rican 101 questions and answers we have limited this section to include only the most recent items. For more Puerto Rican 101 see EL BORICUA, a monthly cultural publication for Puerto Ricans. Send your comments or questions to Puerto Rican 101 at email us and include "Puerto Rican 101" in the subject line.